Cleveland's E.9th Pier is an extremely popular wedding photography location. It's located at the end of E9th in downtown Cleveland. 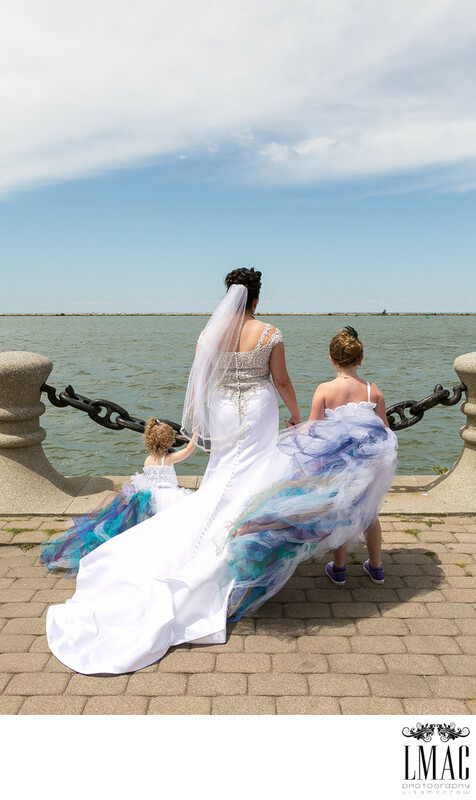 It's stunning views of Lake Erie add to its popularity for wedding photos. The stunning element to this photo are those dresses! This bride selected to add multi-colored tulle underneath the trains in colors of teal, turquoise, and purple. It was a beautiful touch to the wedding photos and we enjoyed featuring it in the photos. At the E 9th Pier, the wind blows pretty brisk at times and made these dresses stand out beautifully. It's always wonderful to be able to have flower girls available on the photo location, especially in photos with the bride. Lake Erie just listens in the summertime and the E. 9th Pier often has beautiful blue skies.